We sometimes hear comments like, “We already have a receptionist. Why do we need an iPad Receptionist?” That’s a great question. The answer is that despite the name “The iPad Receptionist,” we aren’t actually suggesting that this software can replace the hard-working person who sits at your front desk. It’s true that many companies today choose not to hire full-time receptionists, but most (including most of our clients) still do. The role of the receptionist is changing rapidly. Gone are the days when receptionists just answered the phone and greeted visitors. Today’s front office staff are frequently called upon to solve technical problems, provide concierge services, and — most importantly — be brand ambassadors. Here are 5 ways pairing The iPad receptionist with a human receptionist gives you higher returns. In a survey we recently conducted, 66% of receptionists and front office staff agreed that “Companies often do not take full advantage of the skills their receptionists have.” Eliminating visitor management paperwork is one way the iPad Receptionist transforms your live receptionist’s job description. It takes away the mundane tasks of collecting and collating visitor data and frees up receptionists’ time to do other things, including communicating with staff and visitors in more focused, informed, and thoughtful ways. With The iPad receptionist standing guard, your live receptionist won’t be chained to the desk. If you share front desk time among employees, The iPad Receptionist can keep interruptions to a minimum so you can all maintain more work momentum, even while you’re covering the desk. You can also assign a greater variety of responsibilities to your live receptionist without worrying whether they’ll have to step away to complete them. The iPad Receptionist takes care of the logistics of receiving visitors. This means your receptionist’s energy can be more fully directed toward the visitors themselves. 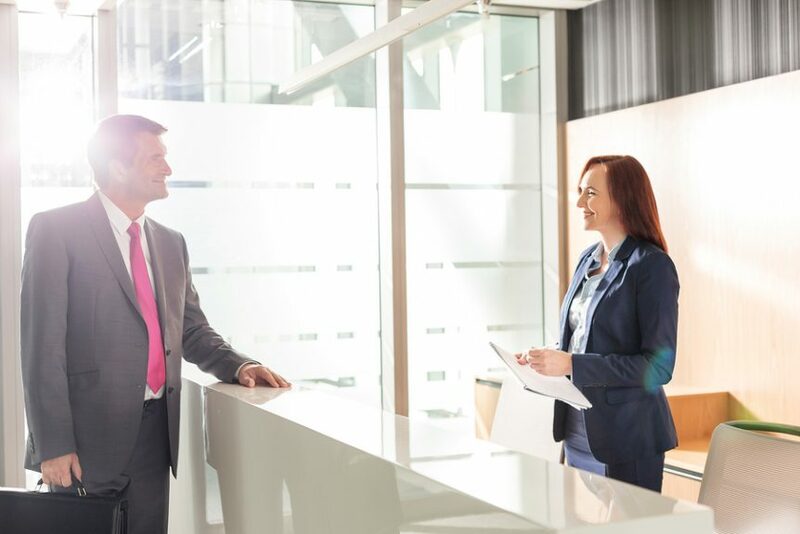 With automation laying the groundwork, live office staff can truly enhance a visitor’s experience by adding the personal touches only humans can provide. Employees can set their own status and special messages in The iPad Receptionist to communicate directly with visitors. This means the humans in the office spend less time playing “telephone” and more time taking care of business. The iPad Receptionist also standardizes and streamlines routine communications such as printing ID badges and signing NDAs. This ensures that all visitors receive the same forms and instructions, regardless of who’s watching the desk. Receptionists traditionally spend a lot of time directing visitor traffic. The iPad Receptionist lets employees manage their own visitors. With routine traffic direction covered, live receptionists can take on expanded responsibilities that match their unique skills and experience, making them feel less like a robot and more like an integral part of the company team. While technology plays an important role in all our company operations, it’s not a “machines-win-humans-lose” proposition. The best technology helps humans do their jobs more imaginatively, creatively, and effectively. This brings you better returns all around. 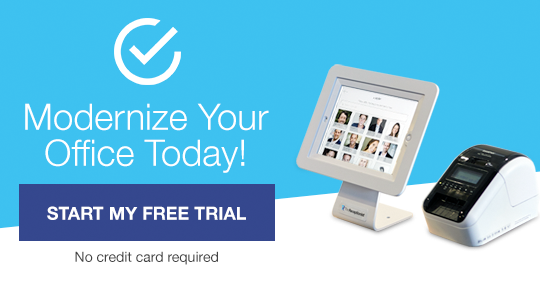 See what The iPad Receptionist can do for your company with a 14-day free trial today.